Sin City is a synonym for casinos, gambling and hot nights out, but that is not all! Without doubt Las Vegas is the right place for everybody who likes cocktails at one of amazing rooftop venues. The best rooftop bars are normally at the top of the amazing casinos. Visit one of many luxurious roof-terraces and enjoy in the company of beautiful young people, famous actresses, and wealthy businessmen. Spectacular views of the desert are just a bonus. Just look at that picture, VooDoo is easily one of the best rooftop bars in Las Vegas. Situated at Rio Hotel’s 51st floor, high above the street crowd, VooDoo is a place for enjoying an excellent Witch Doctor dry ice cocktail, lobster bisque, high-class red meat, and a breathtaking panoramic view of the city. This elegant bar can be an ideal space for romantic and festive dinners as well as personal celebrations. Every weekend, it transforms into a top-notch dance floor with DJ pumping booming dance music. If you get here before 10 PM, entrance is free. Commonwealth is definitely the bar to see. Situated in a central spot in Downtown, it offers you an opportunity to dance on the open air while watching lights of the city late at night. If you prefer drinking a cocktail in the lounge there are plenty of seating. Dance in front of the bar and enjoy an eccentric Moscow Mule. If you have a password, you can visit Laundry Room, their secret club-within-a-club. If any daily club can be qualified as a rooftop bar, it is the Cosmopolitan. 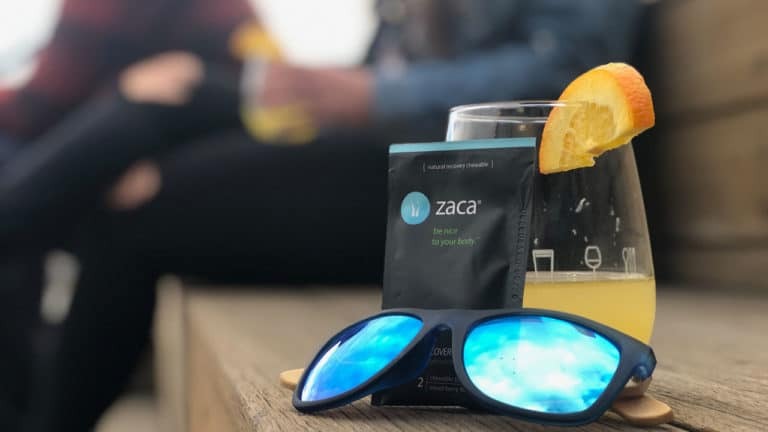 During the summertime, you can come to enjoy electronic dance music while drinking your favorite cocktail near the pool. Throughout cold winter days, take a seat inside this exclusive oasis. Thanks to their first-rated DJs, this place offers probably the best vibrant beach club scene in the city. Located on a 10,000-square-foot deck just above the ground floor of Paris, the Beer Park is a synonym for a frat party feel. As a kind of Budweiser-sponsored park, they offer 36 excellent beers on tap in red cups along large plates of food prepared on their outdoor grill. Come here on Saturday nights to enjoy college football or choose to be a part of exciting party games while sipping your cocktails. 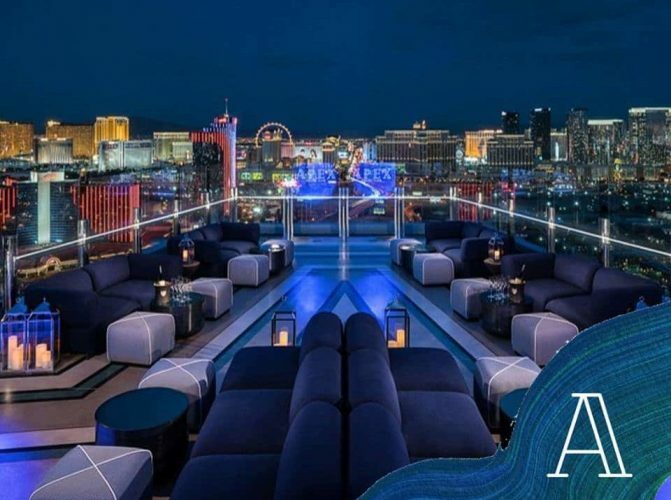 Apex is a magical, trendy rooftop bar on the 53rd floor of the famous Palms Resort in the heart of Sin City. It is pretty difficult finding a seat here without booking a drink-table because it is a relatively small place. Plus, they work only on weekends. Once you get in, you will enjoy the magnificent view from the stylish and highly luxurious roof terrace where you can drink your tipple or one of many delicious cocktails. The Inspire Theater is a roof bar with a killer view where you can enjoy film festivals or burlesque shows depending on your affinities. Everything here is top-notch, from a lovely bookstore to a hot night out and creative cocktails. If you are a hip-hop fan, you will enjoy here because their DJs are specialists. Plus, don’t underestimate Haleomano, an excellent local reggae group. They will complete your magic night at the top of the Sin City. At a balcony of the 64th floor, the Skyfall Lounge, one of the premier rooftop bars in Las Vegas, is waiting for you. A massive sky bar provides a long cocktail list while their DJs play first-rate live music. Take a seat and enjoy a magnificent view of the Las Vegas skyline. It is worth noting that this bar offers 180-degree views, which is a crucial advantage if you have a desire to see the desert sunset. One of the lowest rooftops on our best rooftop bars in Las Vegas is the Oak and Ivy. If you are looking for a Downtown place where you can drink exclusive whiskeys and excellently crafted cocktails? Don’t doubt that Las Vegas’ premier roof bar Oak & Ivy is the right choice! Their classic bar, situated inside a shipping container, offers drink made from high-quality and always fresh seasonal ingredients. The best part is that you can find extra seats up on its top after climbing the stairs. What a solution for overcrowded ground floor patio tables! There are actually two roof bars underneath the Paris casino’s replica of Eiffel Tower. Right next to Beer Park is a lounge and nightclub Chateau with entirely different atmospheres. Take a seat at the outdoor patio and enjoy the view of the Bellagio fountain. If you prefer a hot night out, you will be satisfied with the unique offer of this spot full of high-energy lighting. You deserve a winning combination of panoramic views and VIP bottle service. If you are wondering what the number in the name of this roof bar means, I will help you to solve the mystery. It is the number of the floor on which this bar is located. Can you imagine sitting on the 107th floor and drinking whatever you want including cold beer, various cocktails, and excellent wine? Believe or not, this bar has it all. Take a break from the hustle and bustle and spend a romantic evening here. You won’t regret. What are your best rooftop bars in Las Vegas? Best Cocktail Recipe Book – Top BarAdvisor Picks!